In the place where it all started we'll find the most activity. Come 2012 the Disneyland Resort will still look much as it does today. There will be some changes that are obvious. Like the New hotel(not necessarily a Disneyland Hotel) that Disney is operating. There should be at least one other hotel under construction by then(maybe two). Downtown Disney will be almost twice as large if expansion plans have moved forward by next year. The Resort's Second Gate should look dramatically different in 2012. The small, little McPark that Eisner and Pressler put together will still have problems(which will start to be fixed in Phase 2 starting in 2013, economy upholding), but for the most part it's going to be a much more "Disney" experience. As everything keeps changing, one thing that has bothered Disney Fans all along will finally go down in 2011... Malibooomer. That's right, it's not leaving next year as some have thought. It's going to be one of the last things removed before construction finishes on this phase of the resort. The new theming and attractions, particularly "The Little Mermaid" should be bringing them in creating long, long lines(the center room in Mermaid is almost as big as the entire Golden Dreams building!). But in 2012, when the Cars Land(please change that name! )opens up this park is going to see crowds like it has never, ever had. It will truly make this park a destination of its own. The fact that it's 20% of the park when it opens up alone will create a dramatic difference for those entering the gates. Most who showed up on DCA's opening day will find most of the park unrecognizable. All who show up will find everything more enjoyable. The park that started it all should see the Star Tours update done in time for the anniversary in 2010, while plans for a remake of Tomorrowland won't be done by then, the plans should have already begun to be completed by the 2012 time frame. Another E-Ticket is in line to be built by then, but hasn't gotten to an approval phase so I don't know which ideas will make it through the Blue Sky phase yet. Rest assured, what is proposed will dazzle Disney Fans/Geeks far more than anything proposed during Pressler's tenure. Once all this is done and the Resort is firing on all cylinders then, and only then, will the embryonic focus on a Third Gate move forward. Across the country in that humid jungle known as Florida, the Walt Disney Resort will look somewhat different as well, just not as dramatic. In the Magic Kingdom, work on the renovation of Fantasyland will have been completed. Should all the proposals get approved the area will look quite different from today. At the very least the addition of the Little Mermaid ride will have visitors to WDW experiencing something they haven't seen before and giving this park the most amount of new attractions it's had since opening in 1971. Epcot will be receiving at least one new E-Ticket by 2012, but my Bothans say that the choice hasn't been finalized yet and we may see a couple smaller tickets as well. There are proposals to add at least one new Pavilions by this time should attendance at the parks continue to remain at current levels. The park getting the most love and attention, of course will be Disney's Hollywood Studios. Although the amount of money is a little more than half of what DCA is getting it will be put to use giving this park a more definite theming change than any other. Gone will be the Studio Tram Tour(it leaves by 2010), and in its place will be an expanded "Monstrously Big" Pixar Place. The park should have it's own updated version of Disneyland's Star Tours revision up and running by then. There is at least one new E-Ticket that's slated for construction and several smaller attractions. An update is planned for the Great Movie Ride and at this time there is the possibility of a new E-Ticket based on a very big film to combat Universal's opening of Harry Potter. You didn't think they were sitting around twiddling their thumbs, did you? Alas, no news yet as to if/when they will remove the Hat from in front of the GMR. Not that I hate the hat, I hate the placement... it blocks view of the parks one true weenie. Here's hoping it gets moved by then to a, uhm.... more appropriate(new) location. All those rumors you've heard about a Fifth Gate are True. While I don't think this strategy would work at Disneyland, it should do well here where there are many more international travellers willing to fork over that kind of cash. When Disney's Jungle Trek(a name I don't like, btw) opens it will cater to a more discriminating clientele(read: loaded). Almost like a luxury extension of DAK, it will offer fans of this wild kingdom a little closer look at the uhm... well, wild. Across the pond, Disney's European Kingdom will be experiencing a much needed growth as well. After the upswing in attendance and growth from the fifteenth anniversary of Disneyland Paris, things have never been brighter. Most of the focus on the resort will be Paris' Second Gate because it is the Walt Disney Company's weakest park. Most of what we see over the next few years will be on bringing this park closer to the detail of Disneyland Paris. This is a hard problem since the DLP park is so rich in detail compared to its ugly sister park. 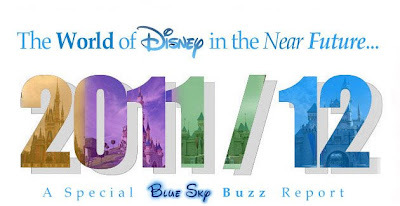 WDI has several attractions planned for WDS, with at least two C/D Tickets definitely planned for the next few year and one really nice E-Ticket(possibly another). The one ride I can tell you that the park is getting for sure is the one that's been most discussed. The "Ratatouille" attraction is coming. It's going to be a very nice ticket, with technology similar to the "Pooh's Huny Hunt" attraction's "trackless" vehicles in Tokyo. Guest will be involved in a chase right out of the film... many have talked about this being a clone of the Crush Coaster, but the attraction will not involve drops so much as it will twists and turns. And it will be a highly detailed attraction(The beautiful queue alone will be amazingly cool! ), which used to be a rare thing to say about a Disney attraction in the late 90's, but will become common over the next four years. As well as this there is talk of expanding the Pixarification throughout the park, specifically an area of the park devoted exclusively to the Lamp's creations. I know this will please many of you that complain about that in the domestic parks, but you have to remember Pixar is now a part of Disney and it will reflect so in the attractions we see at the parks both here and abroad. By the time we see the twentieth anniversary of this park comes around the complaints we have about the Paris Resort will be mostly answered... mostly. Later this week I'll have part two of this report focusing on Asia. It's an interesting time for the Mouse and its world... Stay tuned. Thanks for the info Honor. Keep it commin. Any thoughts on when we can look forward to official announcements of some of these projects? Some of them should hopefully be announced late this year, but most may be announced next year... of course, WDI and the Suits can always change their minds. Was that "Guest" comment a hint or a typo? i imagine it is reference to the "Be Out Guest" AA show originally planned for Paris' Fantasyland. i imagine it is reference to the "Be Our Guest" AA show originally planned for Paris' Fantasyland. Man, it's exciting. Makes me wish I had more money to go hit all the Disney parks. I don't know when (if) I'll ever get back to Disneyland. I'm going to Disney World next year, but I may never get to Disney Tokyo and Disneyland Paris. And I really want to. I'd love nothing more to go to France and stay at a Disney hotel and spend most of the time at the park. It's just such an American Tourist thing to do. I wish I had more time and money. Darn you, Disney, for giving me so many exciting things I want to do, while simultaneously being so far away and expensive! Is it strange that I want to see California Adventure now before the changes? So I can see the differences between now and the future?? Sounds interesting nevertheless. Hope some of this happens. It will definately get me out to Disneyland Paris asap. Great post Honor! I've heard that the Monsters Inc. coaster is coming to Disney's Hollywood Studios around 2011 in time for the 40th of WDW. There's also talk of cloning some version of Cars Land if it does well at DCA. Do you have any info. on the status of Beastly Kingdom for DAK? Yeah, I'd like to hear about Beastly Kingdom too. Talk about a way to counter Harry Potter - a land filled with Disney's best AA figures of unicorns, dragons, gnomes and other fantasy creatures, plus creepy castles and haunted forests would ROCK. As for Fantasyland, the one ride I've heard of that I'm really looking forward to is the Seven Dwarf Mine Ride. I sooooo hope that comes to pass! What's hopefully going to be built in DHS will. Thanks for the update, sounds exciting! Thank you for the article, but why not tell us something about ride or land proposals that are hinted at in the article, but not elaborated upon? All the ones mentioned by name are already well known to the fan community. One of the reasons Honor doesn't tell us everything is something I've heard him talk about before. When Imagineers have several things proposed and haven't decided on one he's mentioned he doesn't want to say "X" will get made and they change their minds and decide on "Y" and then the fanboys will say "you lied". I think he's trying to avoid that so he doesn't give us false information. I don't know if all the things he mentions have been considered known. I don't think anyone has reported on the Maliboomer staying up till 2011. The Ratatouille attraction has been one people have hinted about, like over at Laughing Place, but most of the talk about that is just "wouldn't it be nice if" kinda thinking to me. Honor and his Bothans have been really reliable so far, so I trust him. Also he tends to give clues like when he said "Guest" which wasn't a typo. I think he was saying that one of the proposals is a Beauty and the Beast attraction. Now that's something I want to see. That's something that can get me to book a flight to Paris. Keep up the good work, Honor. Either way, thanks so much for this report. I am PUMPED! Sorry, no more hints from me right now, but if you're lucky the Mouse may give you more info near the end of the year. Any comments on the loving touch the MK is supposed to be getting for the 40th? We already see it happening with CBJ and HoP going down for extended refurbs, but I've also heard from reliable sources that Space Mountain is to be more or less gutted ala Disneyland and the park in general will get a similar treatment to what happened at DL for the 50th. Speaking of the studios, what about the retheming of the Honey I Shrunk the Kids playset to Bugs Life? That one seems like a no-brainer. Lastly, I've heard the exact opposite thing, that DAK is going to be the place for the answer to Potter, but maybe Journey to the Center of the Earth isn't going to be the big rival some think and WDI is planning something even bigger for the Studios? Honor, with the introduction of "Cars Land" in DCA, will California Soarin' be dismantled? I've tried researching the best I can, but I haven't been able to find any info on it. ^^ Why on earth would Soarin be dismantled? It's one of best / most popular attractions in the park and located in a different area than Carsland. So the answer to your question is "no" though there have been a few rumours of a new film on the way. unfortunately, you will probably never see the removal of the sorcerer hat from DHS allowing you to view the GMR as a weenie. there is a licensing dispute between the new owners of the real chinese theatre (which took over in 2001) and disney which doesn't allow disney to sell photos (postcards, tshirts, etc. included) that use the image of the theater without paying royalties. since the mouse seems to make some $$ off those pictures they take of you when you walk in the park, or otherwise they decided to cover it up with the hat instead. Seriously Honor, I know you're a DLR-fan and there's often a big question mark instead of information as far as Epcot is concern (has any else noticed it's the one park with something always going on without anyone knowing? )but could there perhaps be an Epcot-centric update from you? Not knowing anything about the future of the future is troublesome. Feels like Disney World is getting the least dramatic update. Will be interesting to see if Harry Potter's Wizard World gives them any pause and provokes them to more action. By my count WDW is getting a 'tentative' minimum of 14 new attractions. Sounds like a lot to me. After all of the welcomed refurbishments that have been announced for DCA, is a Phase 2 really in the works? okay it is now a new week... what happened to the asia disney resorts update you promised by the end of last week? Could the replacement to Pocahontas be related to Jules Verne by any chace? How about Radiator Springs instead of Cars Land?